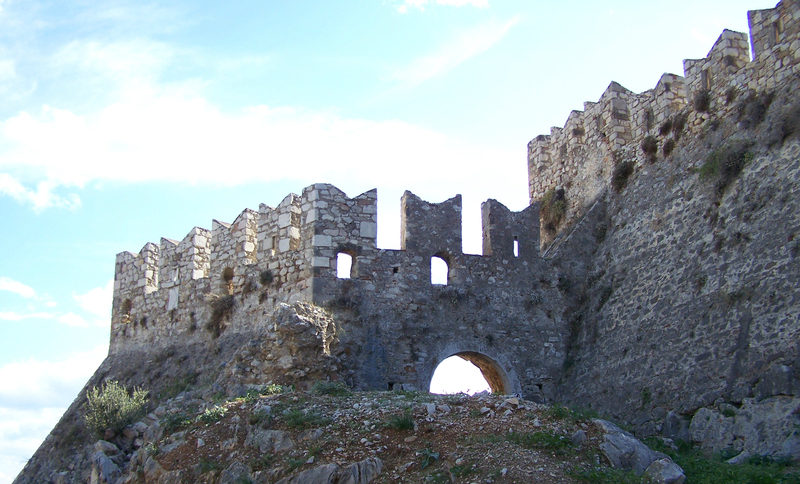 The Palamidi Fortress above Nafplio. 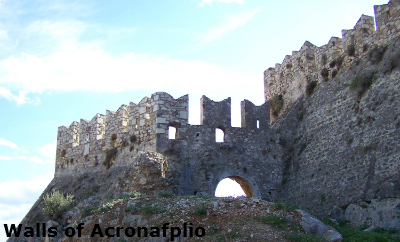 Rising above the old part of town, the Acronafplia fortress is the oldest of Nafplio's castles. 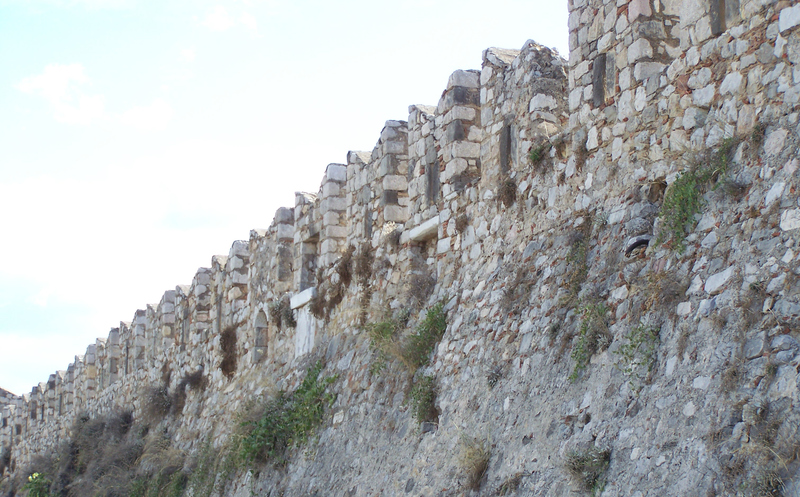 The lower sections of the walls date back to the Bronze Age. 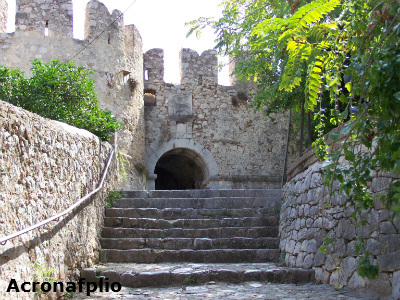 Built on a rocky penisular Acronafplio was the walled city from ancient times until the end of the 15th century. 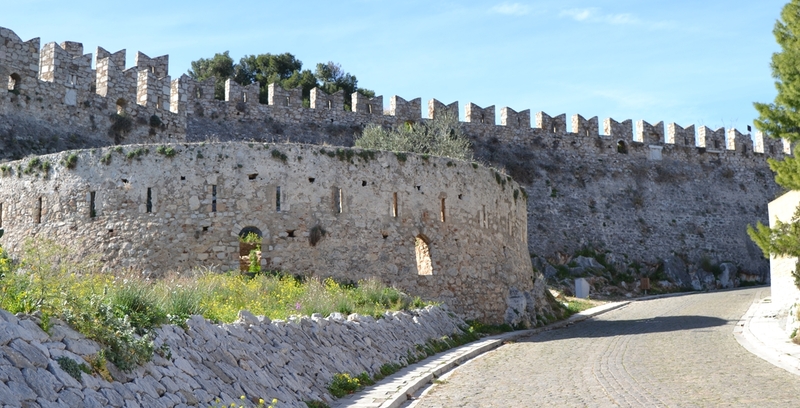 Originally built by the Romans and Byzantines, the fortifications were strengthened by a succession of conquerors, including the Duke de La Roche of Athens, the Venetians, the Turks and then again the Venetians. 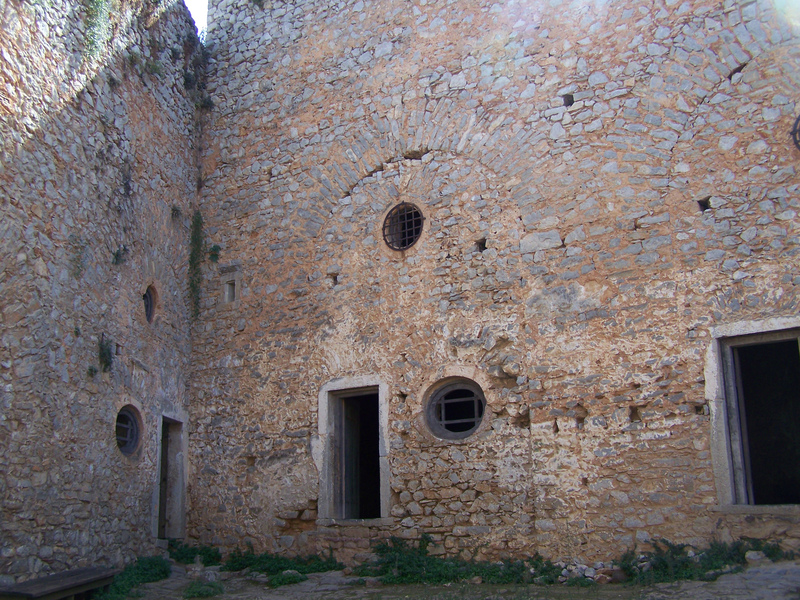 There were two main castles, a French one and a Greek one. 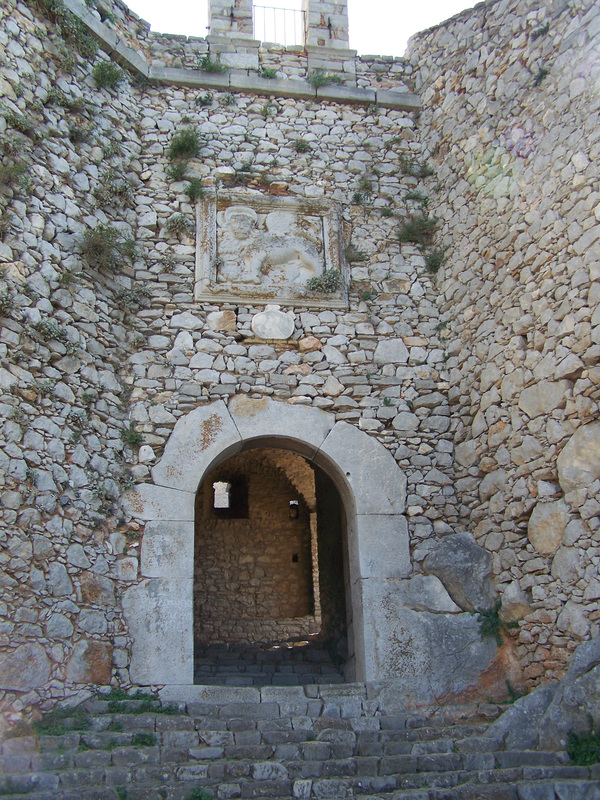 Over time several more bastions were added to the three levels of the Acronauplia. There was no wall on the south or west sides; none was needed as it was a sheer drop to the sea. Already on a peninsula Acronauplia was further separated from the mainland and protected by a moat. The bridge across the moat was built of both stone and wood. Once past the moat, there were two gates into Acronauplia. They were both constructed of iron, but the second one was built like a trap-door, lowered from the ceiling. This second door was decorated with an Arabian sword which belonged to the first janissary to cross the gate when the Turks captured the city in 1715. Acronafplio was used as a Greek political prison from 1936-56. The Venetians continued the fortification of the upper town after taking it back from the Francs who controlled the city for 200 years, and completed their work. 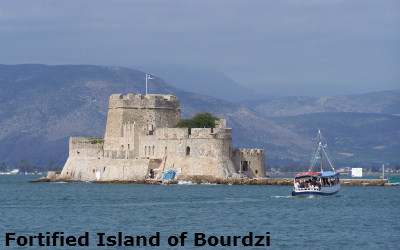 In 1470 the Venetians built a fort on the small island in the center of the harbor called the Bourtzi. To close the harbor the fort was linked by chains. The town was known as Porto Cadenza, meaning Port of Chains. The city later expanded outside the rock, closer to the sea. 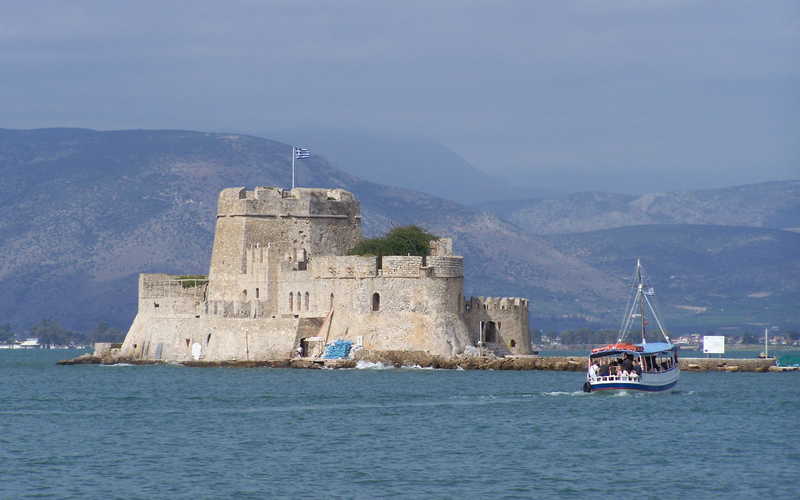 Nafplio was one of the first cities in Greece to win independence. On November 29th, 1822 a group of Greek rebels overpowered the Turks in Palamidi, and the next day the city celebrated its freedom. 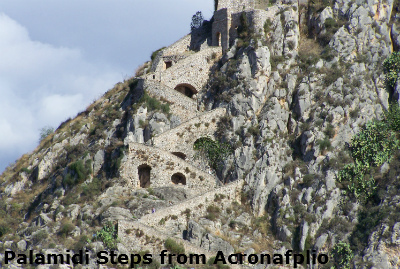 The Palamidi is the fortress that dominates the city on a steep hill with the same name, 216m above Nafplio. Between 1711 and 1714 the Venetians built the castle in an amazingly short time, and this is in fact the final fortress of importance the Venetians built outside their own country. It is also considered one of the most impressive. Yet, in 1715, one year after completion, the Turks defeated the castle. 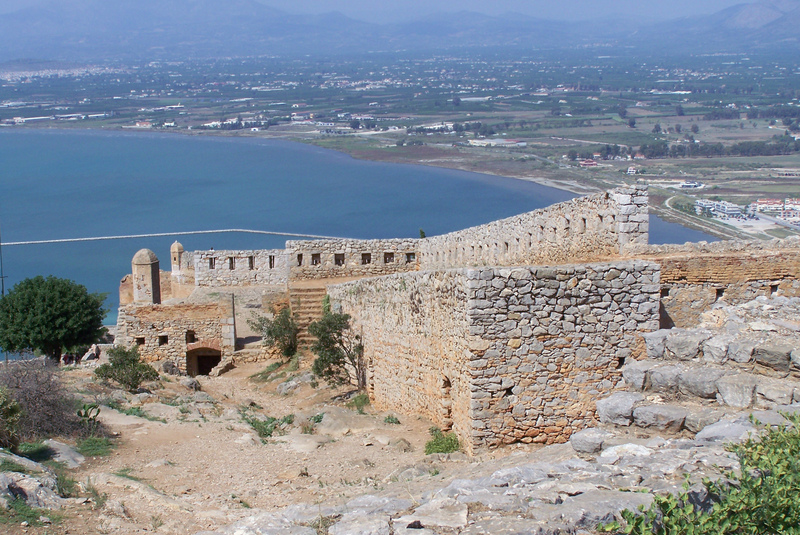 The fortress commands an impressive view over the Argolic Gulf, the city of Nafplio and the surrounding countryside. From 1840 and for nearly a hundred years, the Palamidi was used as a prison, and in conjunction with this the stairs up to the castle was built. The Palamidi is very well preserved, and it is wonderful to walk on the worn stones, between the massive walls and buildings. 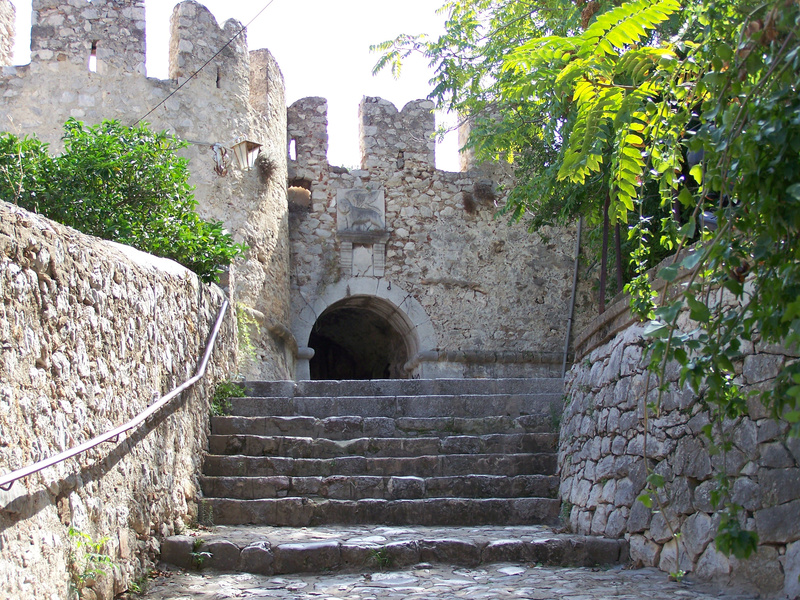 There are 913 steps in the winding stair from the town to the fortress. Although it is widely documented that there are 999 steps this is not true as I counted every one of them walking down. Climbing up them I did not have the breath to count. However, to reach the top of the fortress there are over one thousand steps. 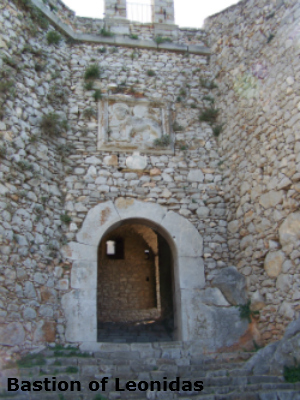 The eight bastions of the fortress were originally named after the Venetian Proveditori (each province was headed by a Proveditori, who combined civil and military authority). 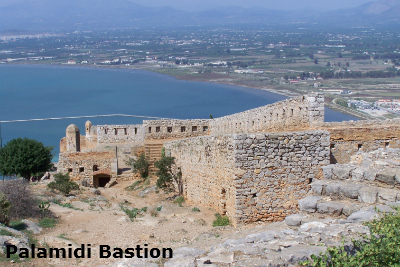 However, when Nafplio fell to the Ottomans the bastions were given Turkish names. When Greeks overthrew the Turks the bastions were renamed after ancient Greek leaders and heroes Epaminodas, Miltiades, Leonidas, Achilles, Themistocles, with the two remaining bastions being named after St. Andrew (Agios Andreas) and the French Philhellene Robert who died in battle on the Acropolis of Athens. In April 1821 Greek chieftains and Philhellenes surrounded the city of Nafplio and liberated it from the Turks under the leadership of Theodore Kolokotronis. 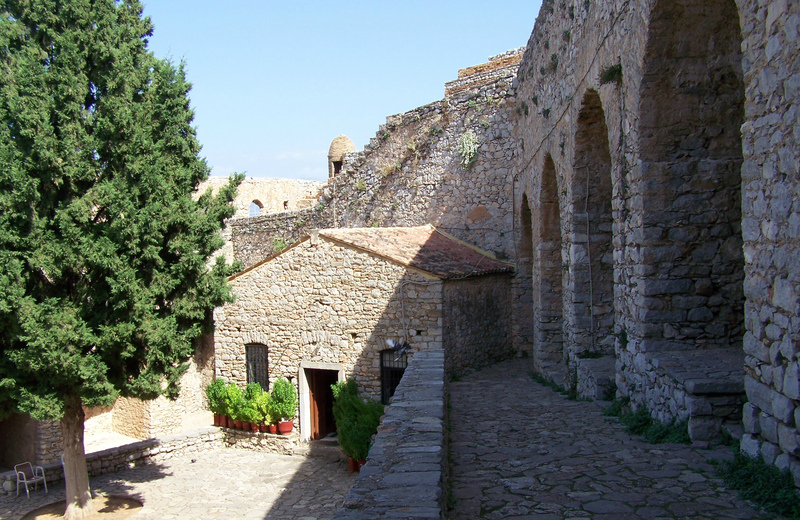 Nafplio became the center of activities which would result in the forming of Modern Greece. 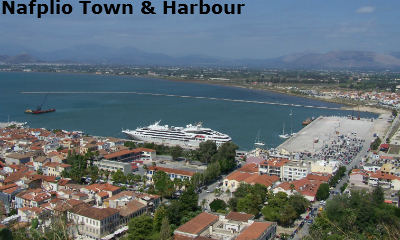 In 1823 it became the capital of the state which was then recognized by the world powers (England, France and Russia) in 1827 and in January of 1828 Ioannis Kapodistrias was recognized as the first governor and arrives in Naphlion. In 1831 King Otto is chosen as the first King of Greece but a month later Kapodistrias is murdered in the Church of Agios Spiridon. In 1833 the King arrived amid great fanfare to the city of Naphlio where he remains until 1834 when the capital of Greece is moved to Athens. 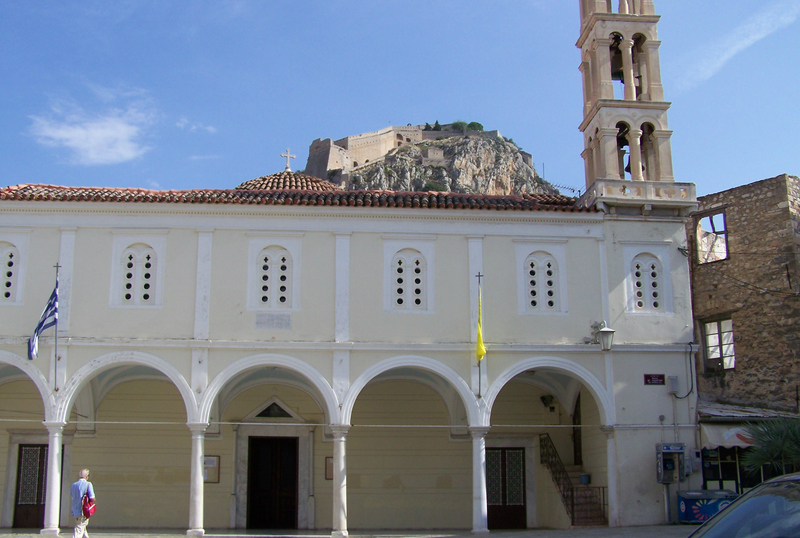 The church of Agios Andreas built in one of the bastions of the fortress. It is a barrel-vaulted church with the eastern half built under one of the arches supporting the walls. Its free-standing part is two-aisled. 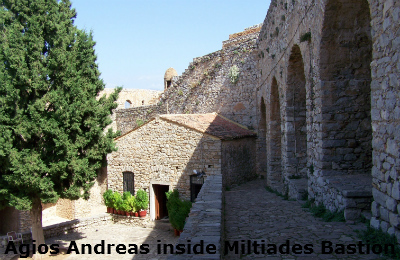 The Miltiades Bastion was used as a prison and held Theodoros Kolokotronis hero of the Greek Revolution. On 7 June 1834, he was charged with treason and sentenced to death though he was ultimately pardoned in 1835. 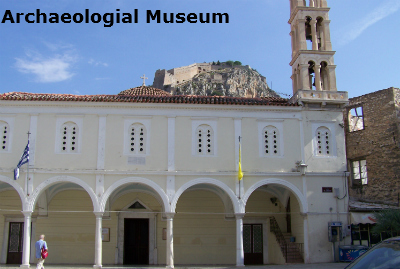 The Archaeological Museum is housed in the old Venetian Armoury building In Syntagma Square. The building was constructed in 1713 by the Superintendent of the Venetian Fleet, Agostino Sagredo, to be used as a warehouse for the fleet. The exhibition is shown in two galleries on the building's two floors; it is organized into themed sections presenting the cultures which developed in the Argolis from Earliest Prehistory to Late Antiquity. There is also a wonderful Military Museum with some amazing photographs which have been gathered over many years. The town was conquered by many nations. All of them have left their mark and strongly influenced its culture, architecture and traditions. Nafplio is very beautiful, it is also a great place to stay as a base for visiting the many wonderful archaeological sites in the area. However, if you book into a hotel and they say there is nearby parking - there isn't. The only place to park is at the port and either walk to your hotel or get a taxi.